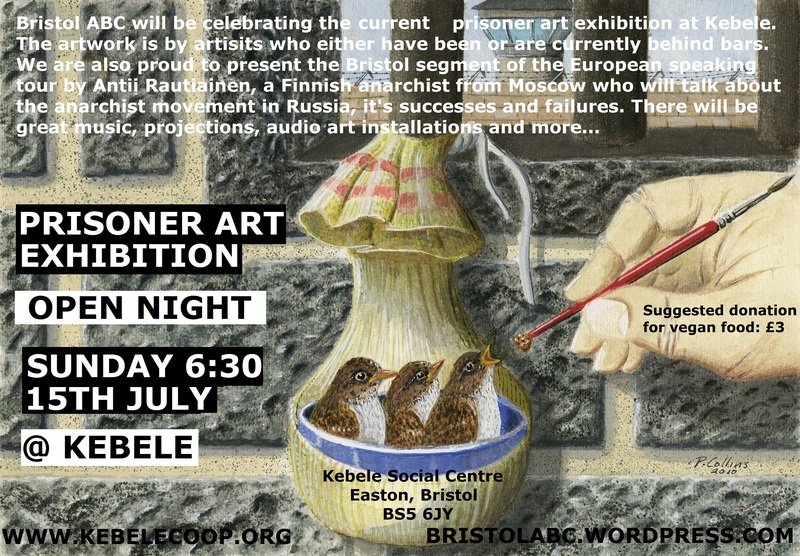 Bristol ABC will be celebrating the current prisoner art exhibition at Kebele this Sunday. The artwork is by artists who either have been or are currently behind bars. 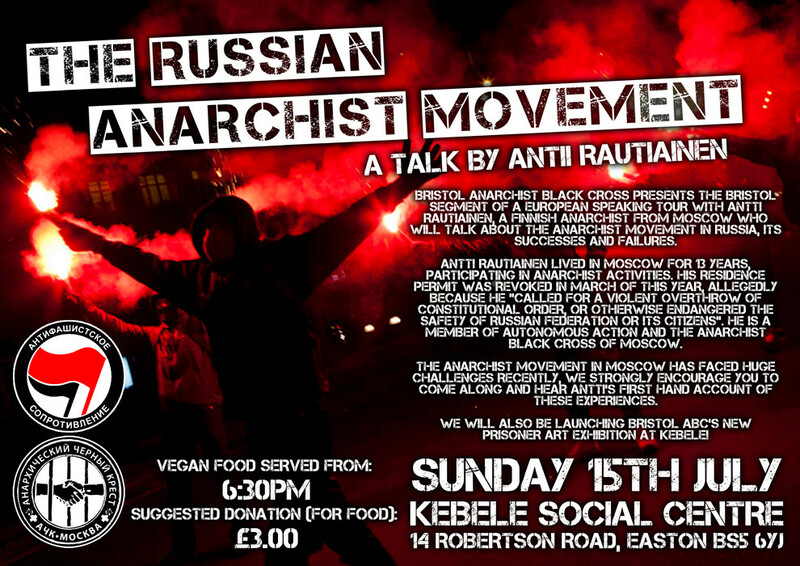 We are also proud to present the Bristol segment of the European speaking tour by Antii Rautiainen, a Finnish anarchist from Moscow who will talk about the Russian anarchist movement, it’s successes and failures. Bristol Anarchist Black Cross presents the Bristol segment of a European speaking tour with Antti Rautiainen. A finnish anarchist from Moscow who will talk about the anarchist movement in Rusia, it’s successes and failures. Antti lived in Moscow for 13 years, participating in anarchist activities. His residence permit was revoked in March of this yr, allegedly because he “called for violent overthrow of constitutional order, or otherwise endangered the safety of Russian Federation or its citizens”. He is a member of Autonomous Action and Moscow ABC. The anarchist movement in Moscow has faced huge challenges recently. We strongly encourage you to come along and hear Antti’s first hand account of these experiences. We will also be launching Bristol ABC’s new prisoner art exhibition at Kebele. Imprisoned since 1980, (and in fact for most of his life before that), John Bowden has been a thorn in the side of the English and Scottish prison systems for three decades. Infonight/benefit evening featuring: Vegan food, discussion on Eric McDavid and Marie Mason’s case, and screening of the documentary “The Jeff Luers Story” (running time: 40 minutes). Vestiges (US) + Downfall of Gaia (GER) + Warprayer. £5 adv, £6 otd. 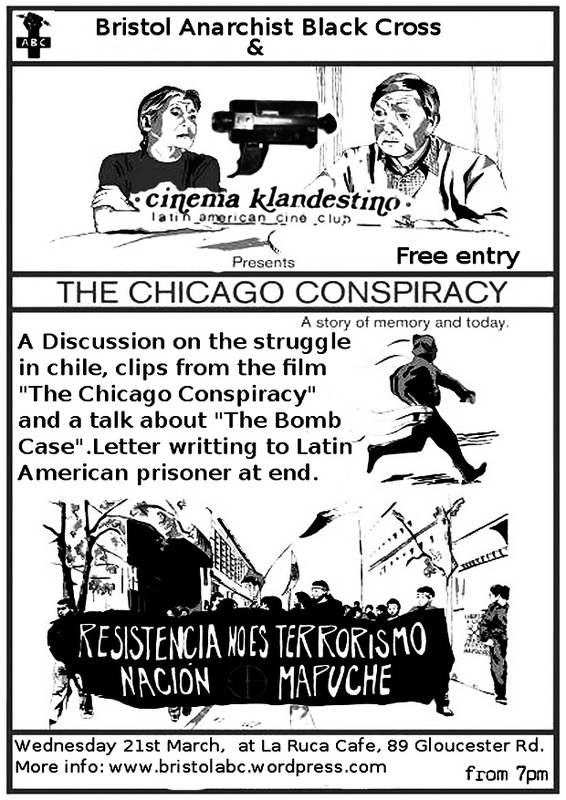 A discussion on the struggle in Chile, clips from the film “The Chicago Conspiracy” and a talk about “The Bombs Case”. Letter writing to Latin American prisoners at end. The documentary addresses the legacy of the military dictatorship in Chile by sharing the story of combatant youth who were killed by the Pinochet regime as a backdrop to the history of the military dictatorship and current social conflict in the area. The larger story is wrapped around three shorter pieces, which explore the student movement, the history of neighborhoods that became centers of armed resistance against the dictatorship, and the indigenous Mapuche conflict. The filmmakers, militant film collective Subversive Action Films, question their relationship to the documentary, taking a position as combatants. See here for more information. On August 14th, 2010, fourteen anarchists and anti-authoritarians were arrested in a series of raids in Santiago in what became known as the `Bombs Case`. They were accused of a series of bombings against capital and the state that took place around Santiago in the previous years, as well as of “criminal conspiracy” under the Pinochet-era Anti-Terrorist Laws. Since then, following a hunger strike by the prisoners, as well as countless solidarity actions from around the world, the charges against nine of the accused have been dropped (one of these people is facing other charges in a separate trial), but charges against five comrades remain. They are: Omar Hermosilla and Carlos Riveros, accused of providing the money to finance the costs of the attacks, as well as Mónica Caballero, Felipe Guerra, Francisco Solar, accused of the placement of the explosive devices at different points in Santiago. The trial continues. 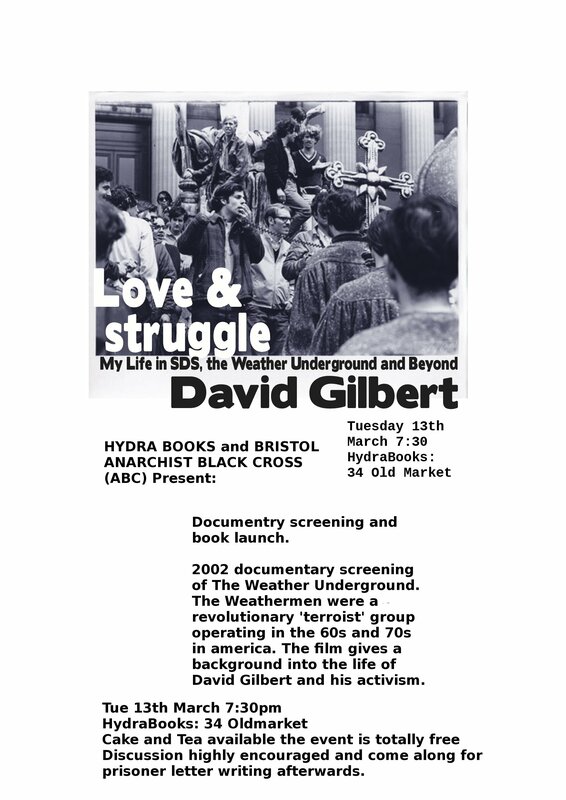 Bristol ABC are pleased to host the booklaunch for David Gilbert’s new book, Love and Struggle and we will also be screaning The Weather Undergound film. Watch the trailer for the Weather Underground movie here. Watch a promo trailer for Love and Struggle here. A nice Jewish boy from suburban Boston—hell, an Eagle Scout!—David Gilbert arrived at Columbia University just in time for the explosive Sixties. From the early anti-Vietnam War protests to the founding of SDS, from the Columbia Strike to the tragedy of the Townhouse, Gilbert was on the scene: as organizer, theoretician, and above all, activist. He was among the first militants who went underground to build the clandestine resistance to war and racism known as “Weatherman.” And he was among the last to emerge, in captivity, after the disaster of the 1981 Brink’s robbery, an attempted expropriation that resulted in four deaths and long prison terms. In this extraordinary memoir, written from the maximum-security prison where he has lived for almost thirty years, Gilbert tells the intensely personal story of his own Long March from liberal to radical to revolutionary.